Jolly arrived to our home the Christmas of 2009. I actually purchased him right after Christmas of 2008. I couldn't find one locally before Christmas day, and then I had to wait a whole YEAR for the tradition to begin! (I don't wait well). Hardly anyone knew about Elf on the Shelf way back then. But when Little Buddy was finally introduced to our Elf on the Shelf tradition, his newly 3 year old self chose "Jolly" as his name from the suggestions we gave. LB was really too little (and too boy) to be creative on his own. But I do love the name Jolly for an elf. I expect this will be the best year yet for Jolly's adventures and for the kids' enjoyment of him! 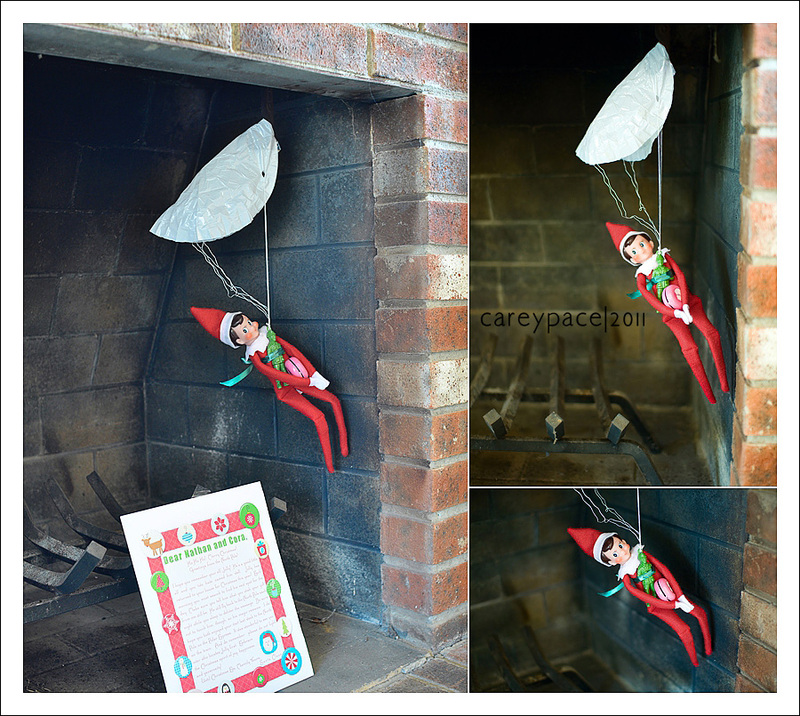 Thanks to Pinterest, we had the idea that Jolly would arrive via toy parachute down the chimney and into the fireplace. The fireplace has been covered by a plexiglass sheet screwed into the brick for the last 4 years. We didn't intend to use the fireplace and we needed to keep little ones out of it since it is located in the playroom. But thanks to Jolly's magical power, he blasted off that plexiglass sheet with his arrival, just in time for the chimney inspector to come on Friday and prepare the fireplace for a real wood fire! 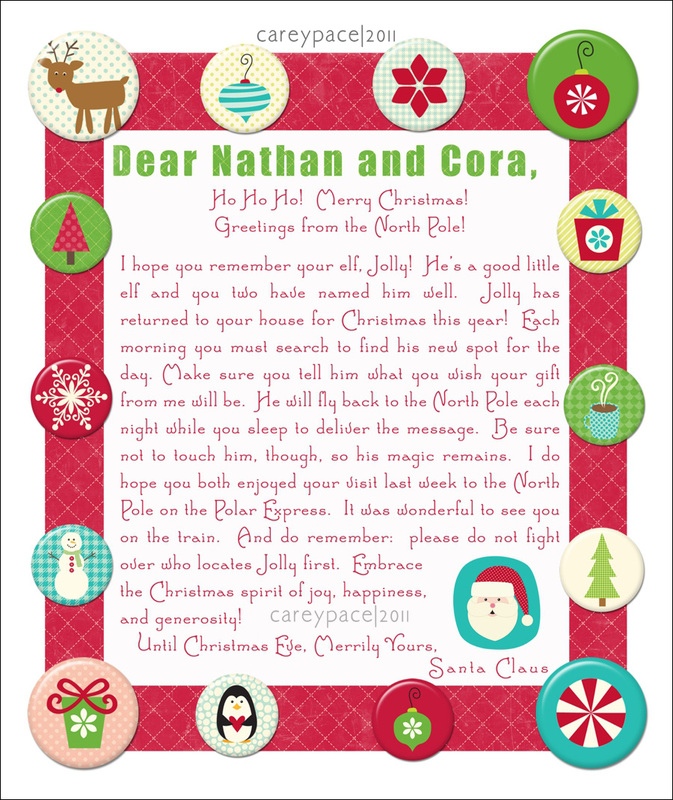 Jolly brought this letter from Santa and left it for the kids to find, along with the toy soldier parachute for Little Buddy and a pink yoyo for the Little Lady. Little Buddy was the first to spot him, though the Lady had spent an hour in the room longer than he. They are super excited! And if you are less than brilliant, like me, you can find the parachute men in the party supplies area of Target. I had to ask and thankfully the knowledgeable toy dudes at Target were able to help! I would have never thought to look there.